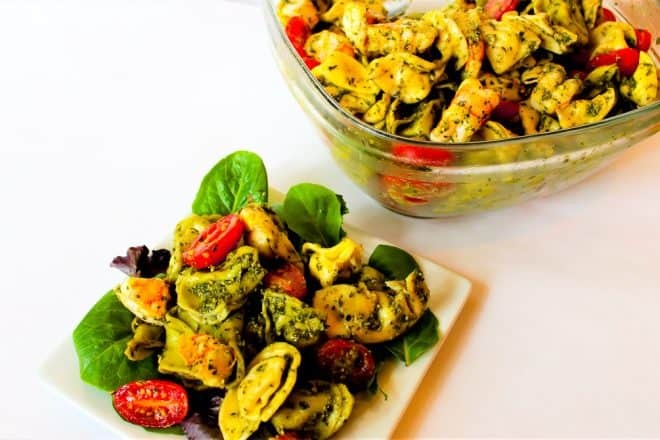 Yes, this Pesto Shrimp Tortellini Salad really comes together in just 20 minutes! Using a few pre-made shortcuts, pesto and tortellini, this recipe requires verrrry little effort. Equally delicious warm or cold, serve it over some baby spinach, and you don’t even need a side dish! Yesterday was a total disaster. I overscheduled our morning, worked on my grad school research project during nap time, and by the time we hit 3pm I was eating chocolate chips by the handful to try to make it through the rest of the day. I gave myself a stomach ache, and didn’t feel any more energetic afterwards (surprise). Though I managed to make dinner (baked chicken thighs, sweet potatoes, and broccoli), I was riding the struggle bus the whole way through. At 9pm, I was laying on the couch crying to my husband that I was too tired to go get in bed. So today I was determined to make it a better day. Luckily we had little on the agenda so I took advantage and most of the day we spent hanging out at home. I even made dinner during Teddy’s naptime so I knew I could relax this evening and not be a total puddle by the time my husband got home. Almost every meal I make has some sort of shortcut in it these days. Today, it was pre-made pesto. Homemade is delicious, but I just don’t have the energy for that most weekdays. Also, I used shrimp as the protein since it cooks up in less than 5 minutes. You can use pre-cooked shrimp to simplify even further, but I think it’s worth the extra couple minutes to cook for the best flavor and texture. While I boiled the water for the tortellini, I pulled the tails off the shrimp and halved the cherry tomatoes. While the tortellini cooked, I sauteed, then quickly chopped the shrimp. When everything is ready you just dump it all in a bowl and mix. Serve it warm or keep it in the fridge for later, like I did tonight! This Pesto Shrimp Tortellini Salad was SO good, and required very little brain power (or manpower!). I love the combination of the doughy, cheesy tortellini with creamy pesto. The cherry tomatoes add a hint of sweetness, and the shrimp is the perfect addition for some protein staying power while keeping the dish summery and light. Fast throw-together weeknight meal that can be made ahead. Rich pesto coats doughy tortellini, sweet cherry tomatoes, and quick sauteed shrimp. Serve on top of greens for an extra veggie serving. Leftovers are great, too! First, boil large pot of water on the stove. When boiling, cook tortellini according to package directions. While water is boiling, remove tails from shrimp, pat dry, and sprinkle on salt, oregano, smoked paprika, garlic powder, and black pepper. You can eyeball amounts. This is just to give the shrimp a little flavor. You can't mess this up unless you dump a whole container on. Halve cherry tomatoes and put in a large bowl. While tortellini is cooking, heat 1 tbsp olive oil in a medium non-stick pan. Add shrimp and saute on each side for 1-3 minutes, depending on size of shrimp. It's done when it turns bright pink. Remove shrimp to cutting board and chop into bite-sized pieces. Add shrimp to the large bowl. Drain tortellini when done cooking, and add to the bowl with the shrimp and tomatoes. Add pesto and mix everything together. I only used about 3/4 of my 7 oz package of pesto. Taste, and add some salt + pepper if needed. Serve warm or refrigerate and eat later - either cold or warm. Serve on top of a bed of baby greens or spinach.